Never mind Mozart in the jungle. You can have Mozart on “strange new worlds”! 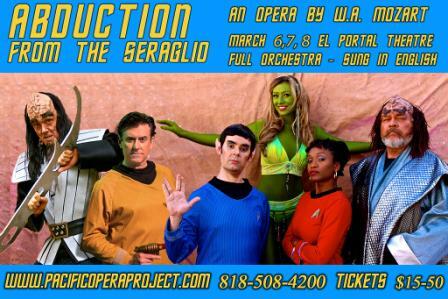 That’s where the Pacific Opera Project takes audiences in its Star Trek-themed version of Abduction from the Seraglio. 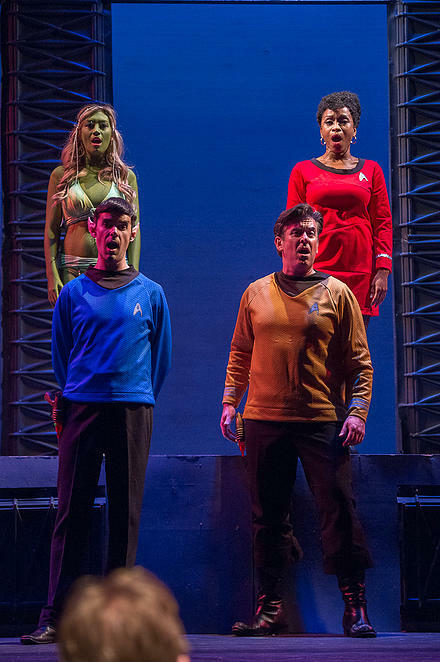 This true space opera, with an English libretto by Josh Shaw, recently completed a limited engagement at the El Portal Theater in North Hollywood. The Turkish sultan is transformed into the Klingon warlord of a distant moon. His 18th-century harem is filled with a gaggle of screaming, multi-hued slave girls. And two Starfleet officers, Captain Belmonte, and a Vulcan, Mister Pedrillo, are on hand hoping to rescue their love interests. Reviewer Courtney Blackburn of the Pasadena Independent praised the actors to the skies. I do want to mention the fantastic performances–each player, from the absolute ham Captain Belmonte to the straight-faced-with-a-hint-of-struggle Pedrillo to the glowering and lanky Osmin to the cutesy slave-girl Blondie to the emotional and strongly feminine Lt. Constanza, absolutely embodied the character given to him or her. Some received more straight-up laughter (Brian Cheney’s overblown mannerisms really killed), but it was the ensemble as a whole that sole this riotous, rowdy comedy set in space. Watch an 8-minute clip of the finale on YouTube. If you’re hooked, view the video of the group’s Southern Illinois festival performance, about two hours long. This entry was posted in Like Show Business and tagged Star Trek by Mike Glyer. Bookmark the permalink. So why did this fill me with such delight? I think it must be the talent of the actors, and the production. And, then, it turns out, all these folk can sing!